Remember a few weeks ago when I was talking about giving Games Workshop another chance after more than a decade away? I took the plunge. 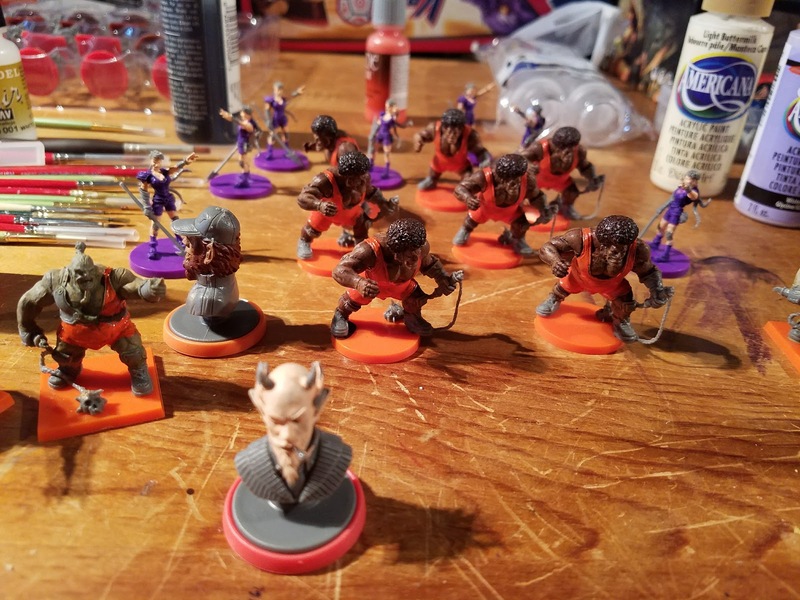 I managed to snag a copy of Shadow War: Armageddon from a local game store (not just the rulebook, either - the boxed game), and picked up some minis to use. And some assembly supplies (glue, for one). When did Games Workshop go all plastic? I also bought a few 40k novels, because I was curious what the lore was. And I'm enjoying them. This series is printed like YA books - largeish print, an undersized hardcover. I also sent a couple of queries to GW's customer service, and received prompt (and polite) replies. All in all, it looks like there has been some significant turnover at GW, and it sounds like their anti-fan policies are either changed or not being enforced anymore. I am 100% in favor of this. So ... yeah. I'm back in the GW customer fold, as it were. Time to warm up the 3D printer - I have terrain to print! I also dug out all of my miniatures painting supplies. I've been bitten by that bug but good. Again. I figured I'd start simple, with the Kaosball teams. They're relatively simple figures, and I'm not bothering to prime them. It makes them an excellent step forward. And ... wow have my skills atrophied. But that's okay. That's part of why I wanted to do this. I'm also not going to take this all too seriously. Because I look at the RPG.net monthly painting thread, and I just cringe. Because these guys are sooo gooood. But the fact that I'm not that good is oddly freeing at the same time. Because it means I can go nuts with bizarro experimentation. Like interference colors. I think that this will look awesome on some of my Necrons. Those of you who don't know what it is - it's paint that changes color depending on your perspective relative to the light. The linked paint is purple and green, but they also make a green/blue and a green/orange. I also don't feel bad about using $2 craft paint for much of my work. I've had good results with it in the past, and I expect to get good results with it again. The only time I'll always choose miniature paint over craft paint is for metallic paints. As I mentioned a few weeks ago, I also bought into Guild Ball, via the two-player starter that they make. It's a really good game. Tons of fun. We're going to be buying more teams for it. And more players for our current teams. So ... yeah. My gaming is in transition right now. I'm not playing fewer board games, but I'm playing more miniatures games. So expect periodic updates on how that's going here. One of the disadvantages of my weekly posting pattern is that I very rarely get to scoop folks - even when I have news early. And that's okay - I'm not doing this to make money or boost my personal fame. I'm a small corner of the internet that tries to have good information. 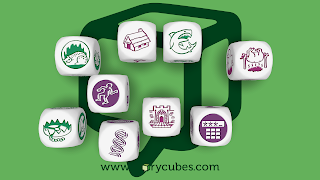 Rory's Story Cubes have been sold to the Asmodee group. 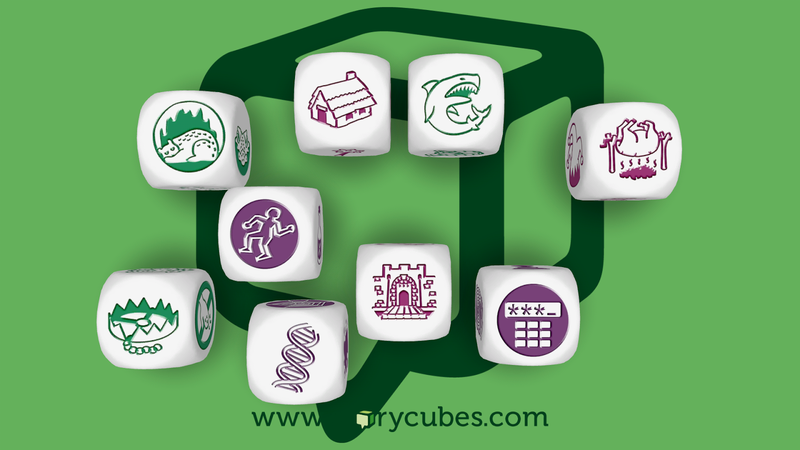 Over the next few years, we (Rory, myself and The Creativity Hub team) will work with Asmodee to help with the brand philosophy and product development of Rory’s Story Cubes. AlphaGo defeated the #1 Go player in the world. It's only the first of three games, and AlphaGo only won by half a point, but this is as significant as Deep Blue defeating Kasparov a while back. There will be another game tomorrow and then one this weekend. I once saw Go described as a game with rules "so simple that they feel like a force of nature." At the same time, there is a depth of strategy to the game that I cannot even begin to fathom. The AlphaGo team will be live-streaming on their page, and I hope to watch. I have to wonder how long before we see similar matchups for other games - Shogi, for example. The 2017 Spiel des Jahres nominees have been announced. The link is in German, but you should have no trouble figuring out which games are nominated. This year, I've only played two of the games on the final list - Ice Cool (on the Kinderspiel list) and Terraforming Mars (from the Kennerspiel list). Both games are excellent and worth grabbing. I've also played two games on the "recommended list," both of them are on the Kennerspiel list: Captain Sonar and The Grizzled. Great games, and well worth your time. You all remember what a fan I am of Rory's Story Cubes, right? A few months back, word leaked that an RPG was due in October. That made me happy. Because I'm always looking for more ways to use the Cubes. Because they really are a fantastic tool. Well, the project is a Kickstarter, and it has launched! I'm watching the videos right now - which is unusual for me. I don't often watch Kickstarter videos. The game as-written is a GM-less episodic storygame. Honestly, it looks like playing the rules included with the Story Cubes themselves, only with a bit more guidance to steer play. It won't be to everyone's taste, but it looks fascinating to me. Watching the videos, I suspect that my author friends (and there are a ton of them) will appreciate this, too. It can be used for scenario design for any RPG, or as a writing aid for novels (or short stories). At the start of each session, every player draws one cube randomly from a bag and then rolls it. At any point during the game, they can spend that die for a story-based benefit or for a Free Raise on a roll. A similar tweak can be applied to just about any RPG. Spend the cube for a bonus on a roll or for a story-related benefit in a situation where dice aren't necessarily going to be rolled. And that's just one face of one die. And is just fantasy-flavored. Imagine these dice for a super-hero game. Seriously: These things are awesome and you should totally be using them for everything. And this Kickstarter is a pretty inexpensive way to get in. For £20, you get a set of cubes and the RPG. That's about $25 US. Since the cubes themselves are around $15, that's $10 for the RPG. I call that a "screaming deal." After not attending any gaming conventions last year, I found myself itching to mingle with my people in large numbers. Realistically, I should have gone to GameStorm (which is only a few hours away from us). This year, however, Steph and I decided we wanted to go to Origins. The last time I was there was about a decade ago, and I was working for Asmodee. The booth crew was just Chris Boelinger and myself, and we had a great time. We sold a ton of stuff and ran a bunch of demos. And Chris did karaoke at every bar in town he could find that had it. That was the Origins when Alex Figuere introduced me to Mr. Jack (albeit in its earlier incarnation as Une Ombre sur Whitechapel), and I have very fond memories of the trip. I also have friends in Ohio that I didn't have at that point. Most notably The Badger. The man I have been Ponybombing for several years, now. So if you're going to Origins this year, we may bump into one another. I realize I didn't get a post up in advance of International Tabletop Day this year, but I did head to my FLGS to participate. And I had a great time. I got to play Deus (which has reportedly gone out of print, which is a shame), with the Egypt expansion (which I really like). I won by one point. It was a very close game, and my opponents seemed to enjoy it. It's a light tableau-builder with minimal direct player interaction. The expansion adds more interaction, but doesn't make it overly-complicated like so many expansions do. We followed that with a game of Splendor. I don't know if I've discussed it much here before, but Splendor is one of those games that is simple enough to serve as a gateway game but that has enough meat to it that experienced gamers won't be completely bored off of their rockers. I never do well at this game. Well, usually. On Saturday, I won pretty big. I scored eight points in one turn to trigger the endgame, and I was ten points ahead of second place. And I wrapped that up with a game of Tokaido. I know I haven't mentioned that one here before, but it's another of those painfully simple games that has just enough strategy to keep it entertaining. I lost this one. Badly. Many thanks to Fantasium for hosting the event. I was afraid that no game store after Phoenix would feel like home, and they have really stepped up. And they did it without doing anything specifically for me - I just needed to warm up to them. This is extra-weird for me to say, because they're not a "focused" game store. They're a comic book store with a (growing and good) game section. Honestly, it's the first time I've seen a combo store like that that has handled the game part of the equation well. The day after ITTD, I was able to talk Steph into playing Guild Ball with me. We didn't get through a full game, but that game is really growing on me. To the point where I had to tell Steph that she is in charge of the Guild Ball expenditures in the house, because I will spend all the moneys on it. It's fun. I'll be writing more about it at another time, I think.